This article originally appeared in CBC Canada. Zaynê Akyol lived near the Iraq-Iran border to capture portraits of female Kurdish fighters, producing a series of arresting images that were quietly unveiled last week in Montreal’s Mile End neighbourhood. The show’s vernissage was on a record-cold day, so the slimmed-down exhibition was greeted by a similarly slimmed-down crowd. She’s a filmmaker and makes it clear she doesn’t identify as a photographer. She was simply excited to be offered the space and attend her first vernissage. 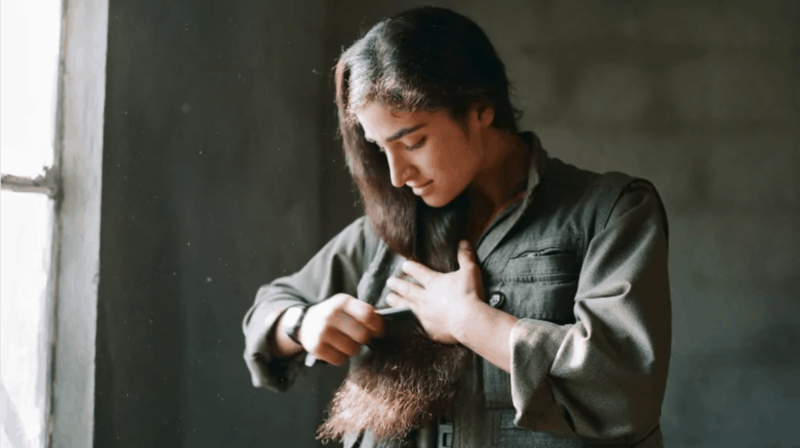 In order to take the photos, Akyol lived with female members of the Kurdistan Workers’ Party (PKK) in the Qandil Mountains, where the PKK has its headquarters. The PKK is an outlawed rebel group fighting for an independent Kurdish state in eastern Turkey. Akyol also spent time in Kurdish strongholds in Makhmour and Kirkuk in northern Iraq. “There is a huge war against the PKK,” said Akyol, who still holds Turkish citizenship. “So just having a movie about them, [considering] the censorship in Turkey, I wouldn’t go to Turkey. Many of these women have opted to fight, leaving their families forever, as opposed to marriage. “Married women are dedicated to slavery, they are never happy,” says one woman in Gulîstan. “I lived with them, I was so attached to them,” she said. But after finding out one of the main characters in her film was dead, she decided she didn’t want to know who among the others had survived. She heard only half did. Akyol’s work telling the stories of women Kurdish fighters will take her to northern Syria in 2019. The commander has already agreed to take part in the documentary and Akyol has secured funding for the project. She expects to film over two or three months, but for safety reasons, can’t say exactly when. This article was originally published in CBC Canada.